Successfully Added SJ9000 Wi-Fi HD Action Camera - 1080P, 30 fps, 170 Degree Angle, 14MP, 2 Inch LCD Display, HDMI Out (Silver) to your Shopping Cart. The SJCAM SJ9000 is sturdy waterproof action camera with lots of great features. It can capture your adventures in HD, not let any detail go missing with a 170 degree wide angle lens and share your exciting footage with he world instantly thanks to Wi-Fi connectivity. 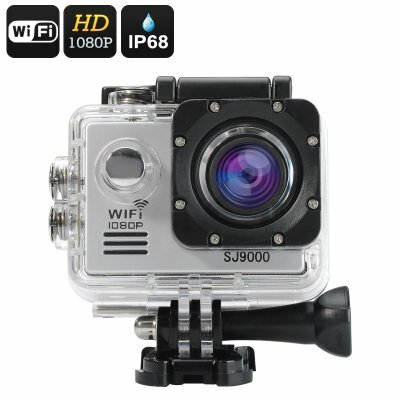 The SJ9000 action camera comes with all the functionality you may even need in a sports camera. It’s sturdy, reliable, compact, waterproof up to 50 meters with a waterproof case and can offer great video and image quality. With the SJ9000 sports camera, you can record 1080p footage at 30 frames per second and capture most of the background with a 170 degree wide angle lens. You will also be able to take quality images at 14MP and view them in detail thanks to the 4x digital zoom. Hook up the camera to your TV via the HDMI port to see all your recordings on a large screen – or preview them instantly on a compact 2 inch TFT screen. Alternatively, you can also share your footage over Wi-Fi and post directly on social media or send media via email. The HD action camera comes with a set of mount accessories and adapters and a sturdy waterproof case that will allow you to take the camera to up to 50 metres underwater. The sports camera comes with apps for both iOS and Android devices and makes interacting with the camera easy and convenient. The SJ9000 action camera comes with a 12 months warranty. Brought to you by the leader in electronic devices as well as wholesale action cameras..